This picture shows the card my son made for me in class May 1994. He was seven years old. This is a sweet card. The leaves (actually the sepals) can be opened or closed. Click on the image to see a large version of the card. Today, I drew a rose and sepals for the printable card that is linked below. I made two versions of the mother's day card. One is black and white and the other one has rose lines on the flower and green lines on the sepals. Pictured to the left is the new card printed on colored paper using the color pdf. I recommend printing the rose and sepals on heavy paper if you have it. The card can be printed on colored paper as shown in the images on this page. Alternatively, the card can be printed on white card stock and then colored by the child. Michelle [appliejuice.wordpress.com] used this project in her co-op and posted an image. Print the file on your choice of paper. 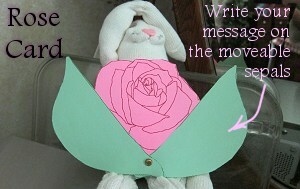 Have the child cut out the card and write the mother's day (or grandma) message on the sepals. Depending on the child's skill, he can cut the holes and assemble the card with the roundhead fastener. Have the child cut out the card. After that he should write the mother's day (or grandma) message and color/decorate the card. Depending on the child's skill, he can cut the holes and assemble the card with the roundhead fastener. Note: Punch the holes for the fastener on the little circle that is at the bottom of the two sepals and the rose. Optional: Add a small piece of tape behind the hole locations before punching them or add hole reinforcers after punching. Reinforcing the holes is optional.